Were you aware that your homeowners or renters insurance will rarely cover the full value of your fine jewelry in the event of theft or loss? And depending on your deductible, you may not get anything at all! In Portland and Vancouver, to safeguard the full value of your fine jewelry, you must have a professional appraisal for each piece and then have it insured as an attachment to your current homeowners or renters insurance or under a separate policy. 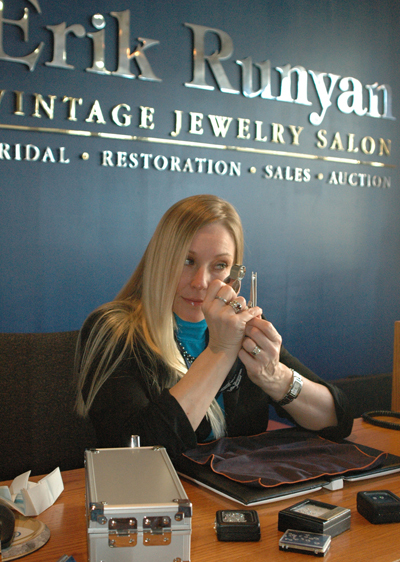 Janean Reynolds is our resident Appraiser at Erik Runyan Jewelers. Mrs. Reynolds brings 20 years of jewelry industry experience to Vancouver. She has studied with the Gemological Institute of America (GIA) and currently holds her Diamond Grading Certificate. You can call Erik Runyan Jewelers at 360-699-1917 and make a 30 to 45 minute appointment for each item where you can visit with Janean while doing the appraisal, and ask her any questions about the process. Prior to the appraisal our staff will check the jewelry to see if it needs any repairs, and is properly cleaned & polished. You can also make an appointment to drop off your jewelry and we will appraise it and schedule a time for you to pick it up. You may want to verify with your insurance company how often they require an appraisal in order for the insurance to remain valid. The cost is only $100 per piece and you get a copy for your records and a copy for your insurance company. If you’re looking for jewelry appraisal services near Portland, OR, come into Erik Runyan Jewelers. We want you to have peace of mind when it comes to your jewelry.